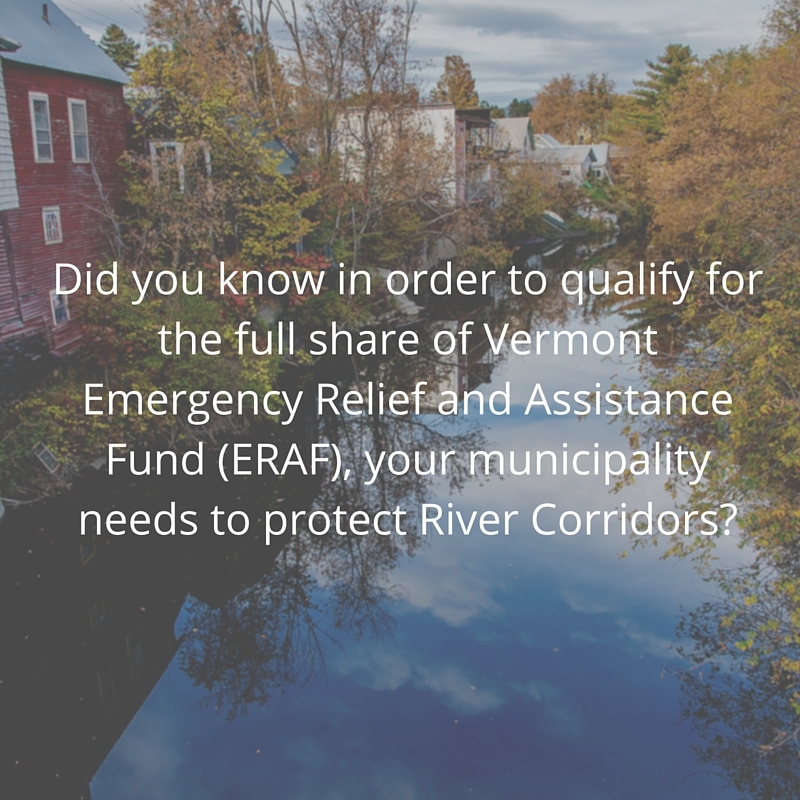 Did you know in order to qualify for the full share of Vermont Emergency Relief and Assistance Fund (ERAF), your municipality needs to protect River Corridors? 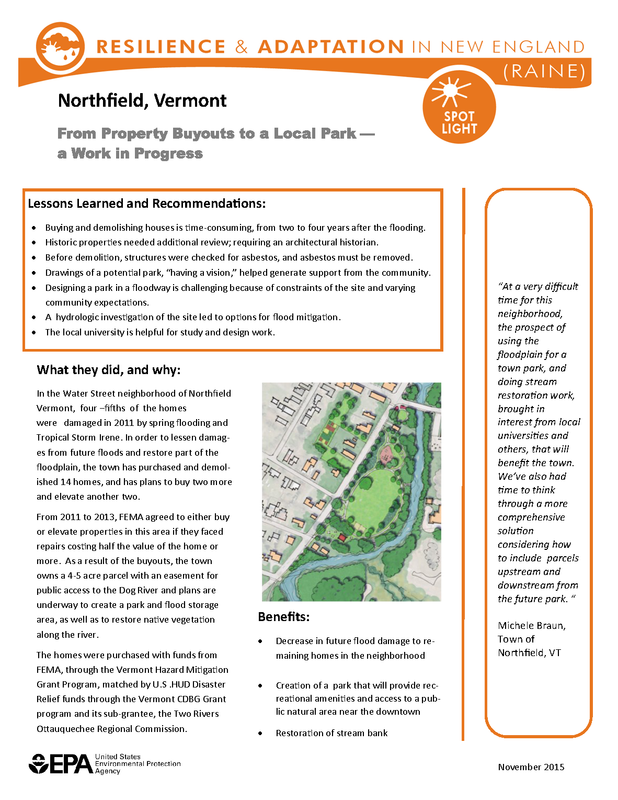 Please join the Central Vermont Regional Planning Commission for a FREE community workshop to discuss River Corridors & Stormwater/ Developed Lands on Wednesday May 4th from 4:00-6:00 PM at the Northfield Library Community Room. Light refreshments will be served. Please feel free to invite interested community members. CVRPC is very excited to announce that CVRPC’s Vermont Road Erosion Risk Analysis project has been chosen to receive a 2016 Excellence in Regional Transportation Award by the National Association of Development Organization (NADO) Research Foundation. The award recognizes noteworthy projects that help meet regional needs in innovative ways, through cooperation with partners, increasing system and community resilience, and in many cases, using creative funding. These projects serve as models for many different transportation program areas that regional development organizations engage in. 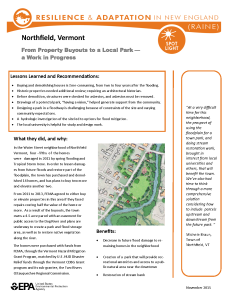 CVRPC’s Vermont Road Erosion Risk Analysis was developed by GIS Manager Dan Currier, in partnership with Friends of the Winooski River, Winooski Natural Resources Conservation District, VT Agency of Natural Resource Department of Environmental Conservation, and Stone Environmental. CVRPC developed the methodology in 2011. Staff subsequently worked with member towns to conduct field assessments to identify erosion sites, and to prioritize these sites based on the site’s ability to transport sediment to a surface water. The analysis and field work position towns to apply for funding and to complete erosion control fixes. 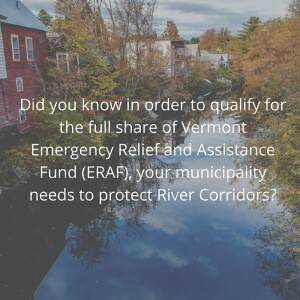 The VT Agency of Natural Resources Department of Environmental Conservation recognized the statewide need to identify potential source of erosions from the transportation network. It utilized CVRPC’s methodology to create a statewide road erosion risk data set. The statewide analysis was completed by Stone Environment with CVRPC participating on the project team. The Road Erosion Risk Analysis is assisting towns and Vermont to address state and federal clean water requirements. As part of the award, Dan will travel to the National Rural Transportation Peer Learning Conference in Chattanooga, TN this June and participate in a special roundtable reception showcasing Award winners. In a separate invitation, NADO invited Dan to participate as a speaker in a session on regional and state collaboration, an honor provided to select award winners. His presentation will be posted to the NADO website after the conference. The complete list of award winners is available at http://ruraltransportation.org/excellence-in-regional-transportation-award-winners-announced/. Congratulations to Dan for his creativeness and ingenuity in addressing a municipal and regional need, and to CVRPC and the Vermont Road Erosion Risk Analysis team for supporting and showcasing Vermont’s innovative efforts! Congratulations to Northfield! The community’s work is highlighted in this month’s EPA RAINE database – https://www.epa.gov/raine. RAINE, the Resilience and Adaptation in New England database, is a collection of vulnerability, resilience and adaptation reports, plans and webpages at the state, regional and community level. Use the RAINE database to share what you’ve done and learn from others. It includes examples of products and plans and read about what neighboring communities are doing to be resilient and adapt for climate change. Visit https://geopub.epa.gov/RAINE/PDF/Northfield_propertybuyouts.pdf for Northfield’s spotlight. Moretown and Waitsfield’s Smart Growth work, and Waterbury’s Smart Growth Scorecard and 2013 Municipal Plan is also available in the database.